When you write content or publish posts, sometimes you may wonder how to add external content in your posts. Yeah... it could be image, links. But those are possible in Blogger post editor. 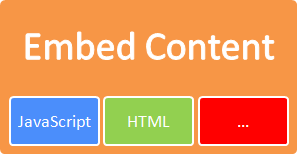 Here I'm referring to external content such as embedding videos, simple widgets, buttons kind of things. Did you wanted to add such a content in your posts. May be not yet. But think of a scenario adding poll widget in a post or it could be a follow button on a page in between text. Wonder how to add such content to your posts via Post Editor? Blogger let you write your content with text and by adding media such as images and videos directly to the post editor while you are in Compose mode. But did you ever try out HTML mode? Alright, that's what I'm talking about. HTML mode of your post editor reveals raw HTML code behind your content. So it will enable you to edit your content if you are much familiar to HTML (Hyper Text Markup Language). Couldn't find HTML mode yet? Be patient and continue with steps below. 1. Navigate to Blogger Dashboard. 3. Now as per your requirement, follow relevant instructions below. Either click New post button to add content to your new post or jump to Posts tab and click Edit link by hovering on your existing post. Jump to Pages tab and either click Edit link by hovering on an existing page or add Blank page via New page drop down button if you wanna embed content in a new page. 4. Now you will be directed to post editor. Switch to HTML view by clicking HTML button on top toolbar. 5. Now add or edit your existing code in the content text area and proceed with other modifications you prefer. 6. After modifying content, click Preview button to see how your code render in your post. Note: Sometimes your code may not render or function well in preview mode. 7. Now Save or Publish your post. This is the one of best, I have learn.. Cheer up.. I sure will come around again.,.